On Saturday night, after leaving the show in May 2013, Bill Hader will return to host Saturday Night Live . If you're a fan of the show, you've likely heard countless times how insane the work schedule is at SNL with cast members and writers working constantly leading up to an episode and staying up all night at times. I know I've heard these stories, but the intensity of putting together an episode of Saturday Night Live has never been clearer to me than when I saw a conversation with Bill Hader at the New Yorker Festival on Friday, Oct. 10 — yes, the day before he would host the show for the first time. Literally in the middle of rehearsals, Hader took some time (I assume, as close to the exact 90 minutes his event allowed for as possible) to speak to a crowd of fans about his eight years on the show, what he was doing before his fateful meaning with Lorne Michaels (he was an assistant editor on Iron Chef America), and what he's been up to since leaving (trying his hand at lead roles in movies). My takeaway? SNL is really, really, amazingly hard, but also really, really, amazingly worth it as long as you have the drive to get through it — and a brilliant technique for dealing with stress. 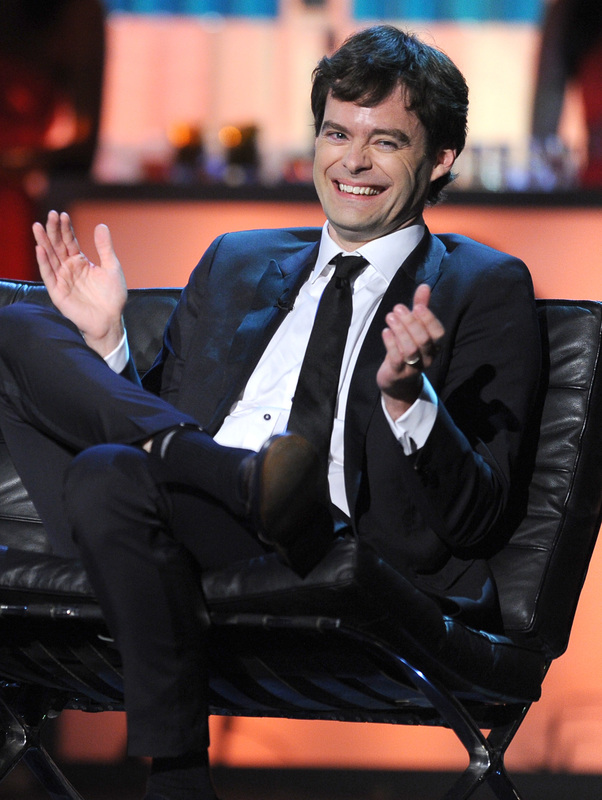 One of the first things Hader, who was interviewed by The New Yorkers' Lizzie Widdicombe, said when he arrived on stage was, that he was "literally in the middle of rehearsals" adding that he told Taran Killam to fill in for his part because "I have to go do this talk." To me, this sounded super exciting. Wow! He's in the middle of SNL rehearsals! That's so whatever the comedy equivalent of glamorous is! But in reality, while being a part of the show is definitely exciting, at least in the moment, the overwhelming feeling is probably stress. As Hader put it, "So when you see me tomorrow f--k up my monologue, give me a break." As for his return to his old stomping grounds, Hader explained, "It's like going back home and your brothers and sisters are like, 'So, what do ya wanna do, Dad.'" This is to say, the host has some additional power that the cast members don't. Hader talked about a room that Michaels takes hosts in to go over the sketches they like, don't like, and which ones they're comfortable with. Hader, even though he was on the show for years, said he never went in this room before. On the night before the show, you may think that most of the sketches have been confirmed, but that is not the case. During dress rehearsals, right before the show airs on Saturday night, the cast performs skits that could still be cut. And specific jokes are often changed not only right before the show, but during it. Hader said he's been on stage and you look over to the cue cards and a writer is scratching out words and adding in different jokes. When you think of Hader, you likely think of his most popular character, Stefon, and Hader seems to get this, joking of himself during the talk that before going to auditions he's been seen simply as "that guy who plays Stefon." But that doesn't mean he's seen the clips over and over again like his fans. In fact, Hader doesn't watch the show back once it airs. A clip of the sketch in which Hader hilariously plays a war vet turned puppeteer was shown during the event, and Hader admitted it was his first time watching it. As for the Stefon clip that was played, Hader remaining facing the audience during the entire thing. The same was true for an excerpt from The Skeleton Twins that was shown. Although Hader didn't watch the Stefon clip, he did explain where the idea behind the character, which was co-created with former SNL writer John Mulaney, came from. Stefon is a combination of a barista Hader knew in New York City (this was the inspiration for Stefon's voice) and an email Mulaney received about a club opening that talked about how the "club had everything" including "rooms full of broken glass." Hader has since returned to the coffee shop where his favorite barista worked and another employee was quick to explain, "He don't work here no more! Your friend don't work here no more!" And while Hader is aware the barista knows Stefon was based on him, he feels confident that the guy is excited rather than upset. Hader also explained the reasoning behind Stefon's famous gesture of putting his hands up to his face. Hader often gave his characters little quirks to calm himself down. He said that for his first four years on the show, he was often nervous about screwing up, but if he allowed himself to "mess up" early on in a sketch, he would feel like he had it out of the way. For instance, if he was playing a game show host and had to said "Welcome to the show," he would change it to "welcome ladies and gentlemen" which wasn't on the cue card. This same idea lead to Stefon's hands and the ridiculous little dance "James Carville" always does. So will Stefon be returning this weekend? Who knows! The last we saw him, he ran off with the love of his life Seth Meyers. (Perhaps a Meyers cameo is in store?) Stefon or no Stefon, Hader will be hosting Saturday Night Live on Oct. 11 and judging by his eagerness to get back to rehearsals after his talk (and, you know, the fact that he was fantastic at the gig for eight years), it'll be a great show.